The 5G networks of tomorrow will need to strike the right balance of products and solutions in order to address the complexities of rolling out and servicing the applications that this new standard will foster. There is no silver bullet when it comes to transforming the ways networks are rolled out today. This is why solutions need to be flexible, provide bottom line efficiencies, deliver value at the edge of the network and address multiple vertical applications. Furthermore, as the largest and fastest growing U.S. 4G RAN vendor, Airspan is able to provide the peace of mind required in today’s ever-changing geopolitical market landscape. Airspan offers a flexible and phased approach that gives operators the ability to monetize their 5G assets and services well ahead of the proliferation of 5G device ecosystems. By introducing integrated 5G Relay backhaul to our multi-award-winning AirUnity and AirDensity platforms, operators are able to dramatically increase the number of 5G connections on their networks. As market proliferation of 5G ecosystems progress, Airspan products enable operators to follow the market in lock-step with solutions like the compact and high power Air5G modular V-RAN platform. This is the perfect toolkit to exploit the full potential of technologies such as mmWave, Sub 6GHz, Massive MIMO, and open V-RAN architectures. Densification without addressing cost and network efficiency puts operators in the dreaded cycle of reduced revenues and increased costs that many are experiencing today. Instead of offering promises, we have measured efficiency gains in customer’s networks at up to 300%, among other revolutionary deployment economics. 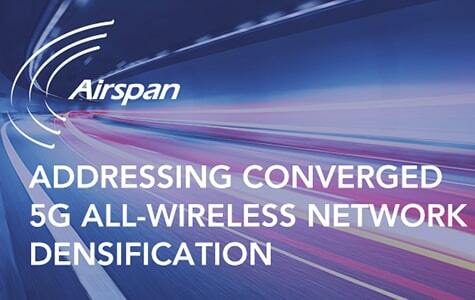 Airspan solutions dramatically cut operators’ costs by complementing existing macro networks and increasing existing capacity. Airspan has proven experience in large scale network deployments with over half a million eNodeB’s installed demonstrating OpEx reductions of up to 87% and CapEx reductions by more than half compared to the cost of a comparable traditional macro expansion. All this while increasing the return on under-used spectrum bands from 8% to 66%. This is thanks to the improved deployment times that solutions, such as AirStrand and AirUnity, deliver. These solutions save time by eliminating the burden of site acquisition and rental from the process, and because they are built with integrated intelligent backhaul. In 2018 alone, more than 20,000 AirStrands were deployed — more than three times faster than the rate at which a traditional densification solution would typically be deployed. Network densification, efficiencies, performance and security can’t be measured and analyzed without an intelligent system. When comparing intelligence solutions, it’s important to ensure that the data captured and analyzed is relevant to your specific objectives and is actionable. Airspan’s operations intelligence offers these standard elements and integrates it with AirSON for applying the analytics to optimize edge performance. Airspan is also opening up avenues to expand services into key verticals including fixed wireless access, Industry 4.0, airborne internet in partnership with Avidyne, autonomous/augmented driving, and smart cities/smart buildings. Whether operated by a mobile operator or in a neutral host service, service flexibility broadens the revenue opportunities of wireless connectivity to match the promises of 5G. One example of these efforts is Airspan’s leadership role in the U.K.-based consortium, AutoAir, which pioneers advancing 5G technology in connected and autonomous vehicles. Collaborators include marquee partners such as McLaren Applied Technologies and the University of Surrey, among others. Participation encompasses various projects including the AirSky project that can deliver over 100 Mbps at speeds in excess of 800 kmh to commercial aircraft in high-traffic flight paths. This is just one-way Airspan pushes the boundaries of technology as part of its effort to deliver products with cutting edge capabilities. Award-winning and innovative operators such as Sprint, Reliance Jio, SoftBank & Turkcell have chosen Airspan to help disrupt the way their networks are deployed and perform. Inquire today, at airspan.com to learn how Airspan can help lay a solid foundation on your path to 5G.